An extraordinary portrayal of humanity set during one of history's most inhumane periods, The Diary of Anne Frank features Millie Perkins as the insightful 13-year-old biographer of her family's two year hiding in an Amsterdam attic. 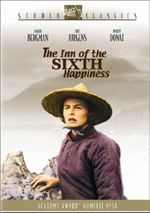 At first, the strong-willed teenager embraces her fugitive lifestyle as an adventure; but in time, the ever-increasing fear of discovery and close quarters prove nearly unbearable for the eight personalities in hiding, which include Mr. Dussell (Ed Wynn), the abrasive Mrs. Van Daan (Winters), her husband (Lou Jacobi), and their son Peter (Richard Beymer), for whom Anne develops an impossible love. 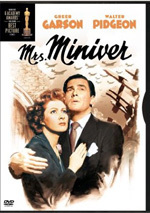 • Audio Commentary with Actor Millie Perkins and Director’s Son George Stevens Jr.
As the defining event of the 20th century, World War II has spawned a tremendous number of films, both factual and fictional. Probably the best-known historical account from an average citizen comes from the famous journal kept by an early teenage Jewish girl. That text first came to the big screen with 1959’s The Diary of Anne Frank. After a quick segment in 1945 to set up the setting and premise, we head back to July 9, 1942. In the face of increasing Nazi persecution, two Jewish families in Amsterdam go into hiding. We meet the Franks: Otto (Joseph Schildkraut), his wife Edith (Gusti Huber), daughter Anne (Millie Perkins) and her slightly older sister Margot (Diane Baker). In addition, the attic houses the Van Daans: father (Lou Jacobi), mother (Shelley Winters), and son Peter (Richard Beymer). Locals Mr. Kraler (Douglas Spencer) and his secretary Miep (Dodie Heath) help hide and care for them. The movie sets up the ground rules, and we learn that the two families can’t move much or make noise between 8 AM and 6 PM due to the presence of workers below them. Gradually we see the various personalities emerge, particularly in regard to the younger inhabitants. Peter and Margot show some romantic interest, but the young man feels irritated by Anne, who clearly wants him to notice her. Eventually the clans add another tenant: an aging bachelor dentist named Dussel (Ed Wynn). He brings some additional conflict to the group; a cranky hypochondriac, he accentuates the worst of the situation. Slowly we watch time pass in their cramped situation. The first half of the flick concentrates on the initial five months of their isolation and ends with a Hanukah celebration. The action then jumps ahead about 13 months to see the situation in early 1944. We find the characters in less positive straits, though they still hold on to some hope. Anne’s started to mature, and Peter develops a romantic interest in her. We watch their blossoming relationship and other changes in the situation for the folks in hiding as their time heads toward its conclusion. I’ve always felt interested in the history of World War II, and I looked forward to The Diary of Anne Frank. I usually feel that personal takes on broad subjects most strongly accentuate the drama, so I thought Frank would be a compelling dramatization of the events. Unfortunately, the film provided only a sporadically successful examination of its topic. Much of the problem came from the casting of Thoroughly Modern Millie Perkins as Anne. For about half the film, she plays Anne at 13, and the other half gives us a slightly older Anne. Perkins handles neither period in a very satisfying way. Already in her twenties when they shot Frank, Perkins seems too old for the part, and she does a poor job of compensation. During the flick’s first half, she portrays Anne as too young. She gives the role a pouty and bratty sheen that seem more appropriate for a five-year-old and don’t connect with a 13-year-old. When we meet the older Anne, Perkins veers too far in the other direction. She gives Anne an air of quiet coquettishness that doesn’t match the girl we saw in the first half. Sure, people mature and change, but this swing seems way too radical. In addition, with the possible exception of Anne, the various characters never develop into full-blooded personalities. Shelley Winters won an Oscar for her work as Mrs. Van Daan, but I’m not sure why. The role stays fairly one-dimensional, as do the rest. Ed Wynn probably brings the most depth to his character. He makes Dr. Dussel sympathetic and warm when necessary but also turns him sour and paranoid as appropriate. It’s a good performance. The others seem fine in their roles, but the parts appear underwritten and thin, so there’s only so much they can do. Diary does have a number of strengths, though. For the most part, director George Stevens gives us a fairly good portrayal of the claustrophobia and paranoia of the situation. Some of the movie’s best sequences concentrate on threats to their safety; these nicely demonstrate their tenuous circumstance. At times the movie feels too light and it could have stressed the tension a little more, but when push comes to shove, we get a good sense of the reality. Easily the best parts of the movie come at its end. Stevens depicts the end of the families’ stay in a lovely manner. The conclusion comes in a heartbreakingly understated way that makes some of the movie’s other flaws all the more glaring. The last reel works spectacularly well and makes me wish that more of the prior two and a half hours had been in a similar vein. Ultimately, The Diary of Anne Frank seems only sporadically successful. An inconsistent film, parts of it come across as well as one could hope, but partially due to erratic pacing and an inappropriately cast lead actress, other elements undercut the experience. There’s enough good stuff here to merit a look, but I must admit I find the flick to be something of a disappointment. 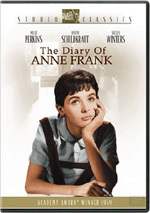 The Diary of Anne Frank appears in an aspect ratio of approximately 2.35:1 on this double-sided DVD-14; the image has been enhanced for 16X9 televisions. This wasn’t an exceptional transfer, but it mostly replicated the source material well. Sharpness usually appeared solid. Some wider shots displayed a bit of softness, but those examples seemed minor. 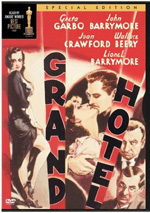 The majority of the flick came across as nicely detailed and distinctive. I noticed no issues connected to jagged edges or moiré effects, but light edge enhancement seemed apparent periodically throughout the film. Blacks looked nicely deep and firm, and contrast seemed good. The low-light shots demonstrated solid clarity and definition, with no issues connected to excessive opacity. Mild print flaws cropped up through the film, but they remained acceptably modest for a 45-year-old flick. I noticed occasional examples of specks, grit and spots, but overall the image was reasonably clean. I fluctuated between a “B” and a “B-“ but went with the higher grade simply because so much of the flick looked so strong. Anne Frank presented a relatively good Dolby Digital 4.0 soundtrack. Not surprisingly, the soundfield remained strongly rooted in the forward channels. Much of the audio remained essentially monaural. Music demonstrated decent stereo imaging in the front, and occasional examples of effects emanated from the side speakers. However, those examples were fairly infrequent, as the soundscape didn’t do much to broaden its horizons. Bells and explosions dominated the side material. Surround usage tended toward general reinforcement of the front channels and added little. Given the limited scope of the action in Frank, however, one can’t fault the sound design for these restrictions. Audio quality appeared fine for a movie of this vintage. Speech occasionally demonstrated some edginess, especially when dialogue competed with other elements; one scene in which many bombs fell demonstrated some of the roughest talking. Still, most of the lines were nicely crisp and reasonably natural. I noticed no problems with intelligibility. As usual for a flick of this vintage, music sounded somewhat thin and constricted, but the score was somewhat broader and better defined than the average movie of the era. Dynamic range failed to impress strongly but still worked out well. Effects also seemed somewhat tinny in general. Some louder elements like trucks and explosions manifested decent low-end, however, and the effects usually were acceptably detailed. Distortion mainly affected explosions, which came across as moderately rough. A little hiss appeared at times, but the biggest distraction came from a light hum that cropped up through much of the film. That never became terribly intrusive, but it remained a minor nuisance and led me to lower my grade a little. Nonetheless, Frank earned a somewhat above-average “B-“ for its audio. Fans of the “Fox Studio Classics” DVDs will find a set of extras that matches up with those of prior releases. On Side One, we discover an audio commentary from actor Millie Perkins and associate producer George Stevens Jr., the son of the producer/director. They sit together for this running, screen-specific piece. In general, they create a useful discussion. They go over quite a few topics. For instance, we hear about casting, the atmosphere on the set, the reasons for the use of Cinemascope and black and white photography, locations, and adapting the original material. Stevens talks the most early, but Perkins soon warms up to the task and offers a lot of good personal observations about the flick. The pair go silent more often than I’d like, but given the film’s extended length, I don’t regard these gaps as a terrible issue. Overall, the commentary seems engaging and informative. As we move to side two, we find a documentary called The Diary of Anne Frank: Echoes from the Past. In this 90-minute program, we get the usual mix of movie clips, archival materials, and interviews. We hear from George Stevens Jr., Millie Perkins, Otto Frank (in 1976), actor Shelley Winters, Anne Frank’s cousin Buddy Elias, Otto Frank’s stepdaughter Eva Schloss, documentary filmmaker Jon Blair, WWII historian David Barnouw, Anne Frank’s childhood friend Laureen Nussbaum, Anne and Margot Frank’s American pen pal Betty Ann Wagner, and Fritz Pfeffer’s daughter-in-law Sigi Pepper. The program covers the diary’s path to publication and other media, notes about George Stevens’ activities in WWII and how they influenced him, casting, issues connected to the film production, and historical information about the Frank family and the era. To my surprise, the latter subject dominates “Echoes”. I thought the show would mainly go over movie material, but instead it concentrates largely on the facts behind the flick. This includes lots of good background and gets into intriguing issues like fictionalized elements in the diaries themselves and other liberties. We find just enough movie information to provide a decent glimpse at its creation. Overall, “Echoes” presents a consistently interesting and compelling look at its subjects. Next we get an excerpt from George Stevens: A Filmmaker’s Journey. In this seven-minute and 50-second clip, we get some notes about Frank. This includes statement from Stevens as well as Perkins but mostly consists of movie clips. Although it’s good to hear a little from the director himself, this program doesn’t include much that we don’t get elsewhere, so it’s only moderately useful. In the George Stevens Press Conference, we get a four-minute and 57-second session. This piece comes from early in the production of Diary and shows Stevens as he discusses the search to find an actor to play Anne and his research for the flick. The first subject heavily dominates this fairly interesting chat. Oddly, Millie Perkins Screen Tests doesn’t actually include that material. We see parts of her audition during “Echoes”, but none of those snippets show up here. Instead, this 130-second piece includes an introductory interview as part of the test. It’s fun to see, but it seems odd that the DVD touts a test that doesn’t appear. Within the Movietone News domain we get six separate newsreels. These include “Millie Perkins, 18, to be Anne Frank in Film of Diary” (60 seconds), “Nobel Peace Prize to Belgian Priest” (22 seconds), “Anne Frank Diary Star Readies for Film’s First Nights” (61 seconds), “Academy Award Highlights” (126 seconds), “Millie Perkins Visits the Los Angeles County Museum of Art” (50 seconds), and “Brilliant Turnout for LA Premiere” (76 seconds). This provides a nice little collection of historical bits. Inside the Still Gallery, we get 82 images. Most of those come from various parts of the production, though we see some location scout shots as well. We also discover two trailers and a restoration comparison. The Diary of Anne Frank takes on an important subject but only provides an occasionally effective examination. While the movie clearly has some terrific moments, it also falls flat at times and seems too erratic to be a thorough winner. The DVD offers generally positive picture and sound plus a very nice set of extras. Enough of Diary works for me to recommend it to those with an interest in the subject, but it remains a moderate disappointment.